When you turn on the water in your kitchen or bathroom sink, you expect it to drain properly. After all, drains typically perform one function: to drain off water from the sink. But like most appliances in your home, drains can wear out and need to be replaced. So, in order to make changing drains easier, sink drain sizes are standardized. What that means is that different types of drains -- in different areas of the home -- have different sizes. The good news is, in virtually all cases, the drain size suits the function of the drain. Your kitchen drain probably does the most work of all the drains in your house. That's why it's important that to keep it clear and running up to standard. A standard kitchen drain is 3 1/2 inches in diameter. This is the measurement across the center of the drain, from one side to another. The drain strainer, the bowl-shaped piece inside the drain mouth, matches this dimension. It is designed to sit inside the drain mount and seal it closed when flush to the drain bowl. All kitchen sinks have a drain this size to make installations easier. The drain connects to a pipe with a 1 1/2-inch diameter. A bathroom sink has a much smaller drain size. Since it is only used to wash hands, shave and brush teeth, there is no need for a larger drain hole. 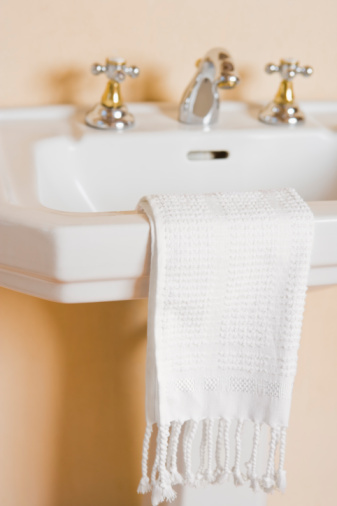 What can sometimes make bathroom sinks tricky, is the fact that some don't come with a drain. If you have to buy a drain to fit your sink, it's important to the correct size before heading to the hardware store. Most bathroom sink drain openings are 1 1/4 inches, although 1 1/2 inches and 1 5/8 inches are also common sizes. After installing new bathroom faucets, the drain is usually replaced. So, it makes sense to standardize the drain size. That way bathroom faucet manufacturers can provide the right-sized drain with their faucet. A bar sink drain is slightly larger than a bathroom drain but smaller than a kitchen drain. It handles more heavy-duty usage than bathroom sinks but not as much use as the kitchen sink. Bar drains are 2 inches in diameter. They connect to either a 1 1/4-inch or 1-1/2 inch tail pipe. These drains, like bathroom and kitchen drains, use a P-trap, which is a J-shaped pipe that connects to the main drain line.